‘What’s for Dinner Mom?’ a refrain that at times has me muffling expletives under my breath. Crazy days of exams & sports & socks, of unwashed floors & grimey bathrooms, sodden towels and mounting ironing piles not to mention the pile of admin on my office desk. Crazy, crazy days and at the end of it all the request for dinner. Left to my own devices on days like this I’d be quite happy with a toasted sandwich poshed up with cranberry sauce and accompanied by a mug of piping hot tea, that would just be heavenly. But for the kids alas that wouldn’t be awarded the ‘dinner’ badge and I would be reminded that even though they’re not actually being starved by their mother they didn’t get a dinner. 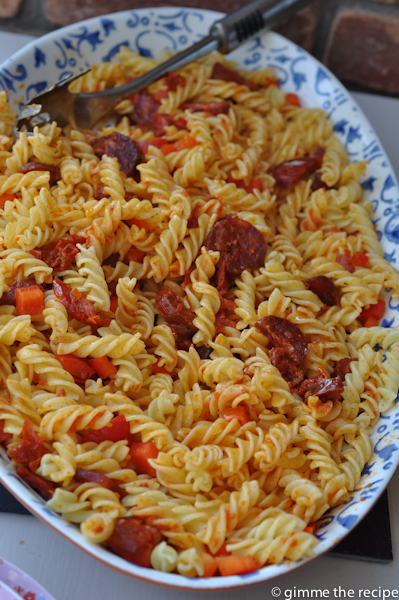 This chorizo pasta supper is perfect for the overwhelming days and can be whipped up in 10 minutes. 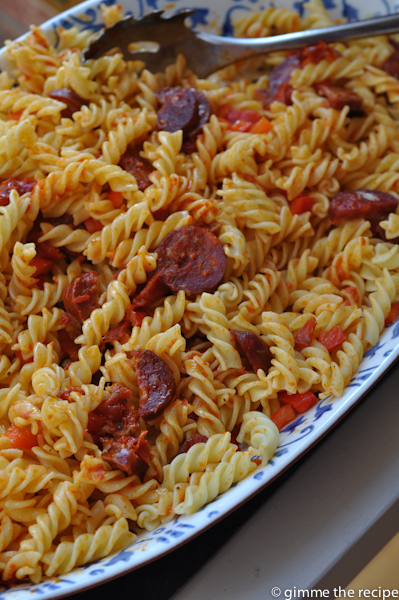 Cook up a large pot of pasta. 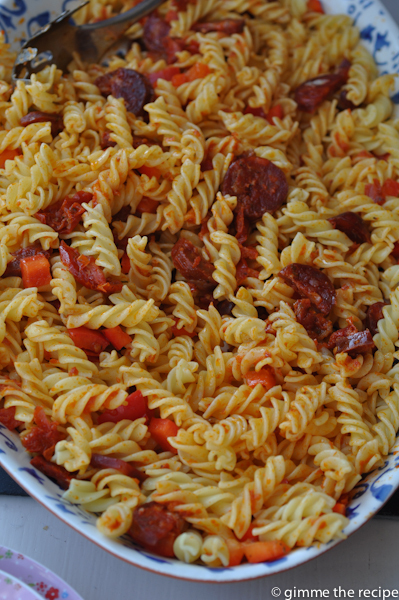 While the pasta cooks cut the red pepper into small cubes and the chorizo into chunky slices. Drain the pasta reserving a little pasta cooking water. Voila – dinner in 10 minutes. You could healthy it up by mixing through some rocket leaves. Very sensible approach. Thankfully, we are past that stage and now the adults in the house take care of their own mess (most of the time). Nice looking pasta. Thanks Conor. Just a few more years of kids growing, watering and feeding to be done and I’ll be through the gap and into the bliss of cooking what I want to eat, all for me! indeed and as long as someone else cleans the pan an excellent suggestion!